Had I been in her shoes, I would have been quaking with fear at the notion of singing before a crowd on my wedding day. Had I been in her shoes, I also would have fallen on my face. I’ve never worn high heels. My friends Danielle and Derek had exchanged their wedding vows and rings just an hour before, beneath a towering White Oak tree at the Robinson Family Ranch. I couldn’t have been happier for them. You see, Derek is a long-time friend of mine who had been a groomsman in my own wedding eleven years prior. On this day, I was privileged to attend the groom on his wedding day. Nope, I wasn’t the wedding photographer this time around, nor the officiant. I played the groomsman. But that didn’t stop me from bringing my camera! The bride and groom had nurtured a transatlantic relationship several years in the making. They relied on emails and Skype sessions to connect their hearts and minds while the two lived far apart in West Africa, South Africa, and North America. To hear their friends and family talk, theirs was a relationship that everyone hoped for but doubted would ever work in light of the distance between them. Now that they both occupied Sacramento postal codes, they saw fit to live life together as husband and wife. They thanked God for bringing them together … which brings me to the moment you see in this photograph. The wedding ceremony had ended. I had accomplished my work of escorting a bridesmaid down the aisle and posing for photographs. I took a place with my wife at the reception table to enjoy some food, friends, and a bit of photography. I snapped photos of friends enjoying themselves around their own tables. I captured images of family giving their toasts. After the kind-hearted jokes and heart-felt tears, I was surprised to see Danielle walk up to the gazebo on her own. A guitarist joined her there, as did the bridesmaid to whom I had offered an arm. It seemed a song was in order! Danielle took the mic without hesitation. She shared that her heart was full of gratitude to God for bringing Derek and her together, and that worshiping God was a central part of her life. And so worship, she explained, was something she wanted to lead her wedding guests in as well. My admiration for Danielle was already great. I knew her to be a kind soul, a hard worker, a follower of Jesus — someone of great compassion. I had experienced her stunning voice as well. But on her wedding day, I learned of her boldness. 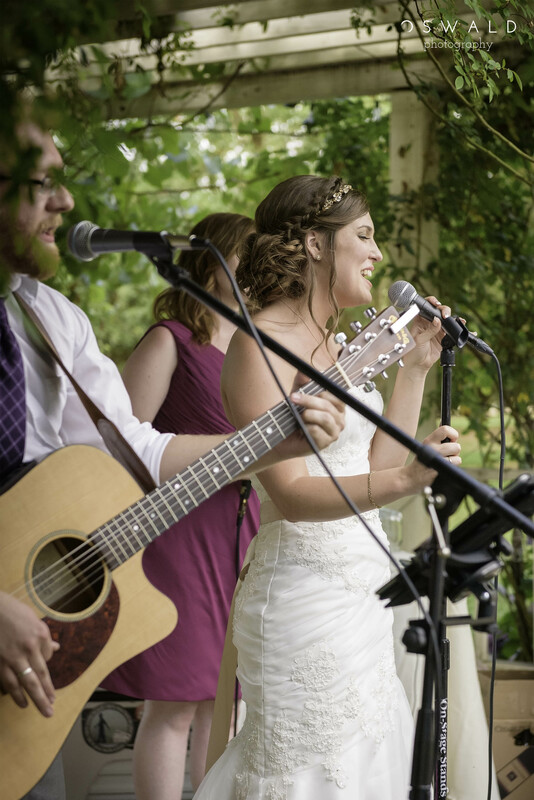 It wasn’t just that she overcame the nerves or post-traumatic stress of planning the wedding day to perform in front of her guests (which is definitely a big deal). It was that she put her faith and gratitude on display for all, regardless of their thoughts on God and spirituality. Derek and Danielle, I pray that your love for each other will only be strengthened and sweetened by time. And I pray that God will remain the source of love in your marriage. I’m so proud to have seen you begin this relationship in such a moving way. You make a great bride and groom, but I suspect you’ll make an even better wife and husband. I’m humbled at your courage. Congratulations on the start of something wonderful! What are some of your most memorable wedding surprises? Tell us in the comments below! Congratulations Derek and Danielle! Thanks PJ for putting that precious memory into words (and picture)! I’m so glad you liked this post, Pam. I echo those congrats!